Andros Island in The Bahamas. Acquired by Landsat 8 in February 2017. Data courtesy of NASA. Blue holes are deep marine caverns or sinkholes which are open at the surface, and they get their name from their apparent blue colour of their surface due to the scattering of the light within water. The often contain both seawater and freshwater, and in their depths the water is very clear which makes them very popular with divers. The term ‘blue hole’ first appeared on sea charts from the Bahamas in 1843, although the concept of submarine caves had been described a century earlier (from Schwabe and Carew, 2006). There are a number of well-known blue holes in Belize, Egypt and Malta amongst others. The Dragon Hole in the South China Sea is believed to be the deepest blue hole with a depth of 300 metres. 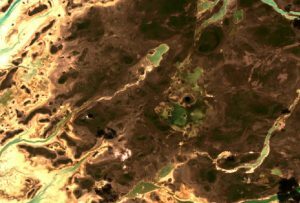 The Andros Island in The Bahamas has the highest concentration of blue holes in the world, and last week we watched a television programme called River Monsters featuring this area. The presenter, Jeremy Wade, was investigating the mythical Lusca, a Caribbean sea creature which reportedly attacks swimmers and divers pulling them down to their lairs deep within of the blue holes. Jeremy fished and dived some blue holes, and spoke to people who had seen the creature. By the end he believed the myth of the Lusca was mostly likely based on a giant octopus. Whilst this was interesting, by the end of the programme we were far more interested in whether you could see blue holes from space. Blues in the Blue Hole National Park on the Andros Island in The Bahamas. 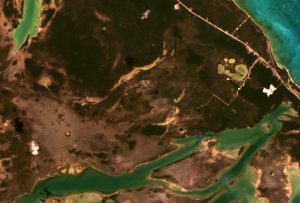 Acquired by Landsat 8 in February 2017. Data courtesy of NASA. Blue Holes National Park covers over 33,000 acres and includes a variety of blue holes, freshwater reservoirs and forests within its boundaries. The image to the right covers an area of the national park. 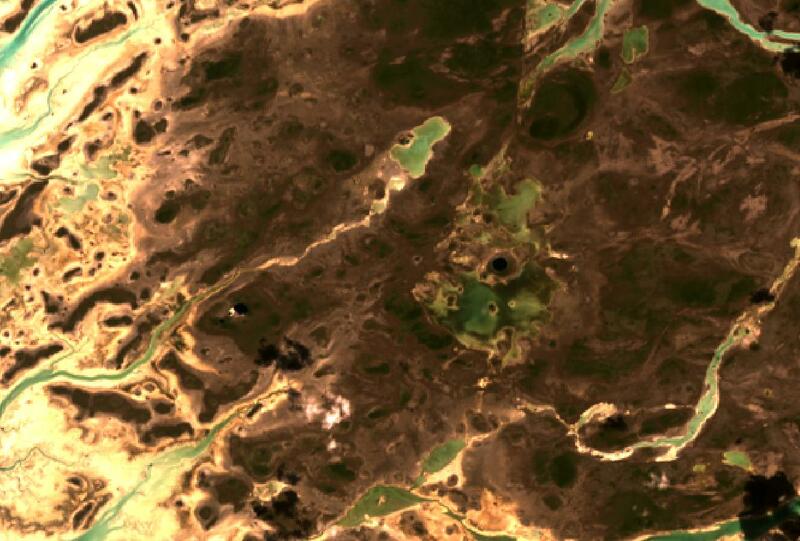 In the centre, just above the green water there are five black circles – despite the colour, these are blue holes. Uncle Charlie’s Blue Hole, also called Little Frenchman Blue Hole, is just off Queen’s Highway in Nicholls Town and has a maximum depth of 127 metres. Atlantis Blue Hole has a maximum depth of about 85 metres. Stargate Blue Hole his blue hole is located about 500 miles inland from the east coast of South Andros on the west side of The Bluff village. Guardian Blue Hole is in the ocean and is believed to have the second deepest cave in The Bahamas, with a maximum explored depth of 133 metres. Blue hole in the south of Andros Island in The Bahamas. 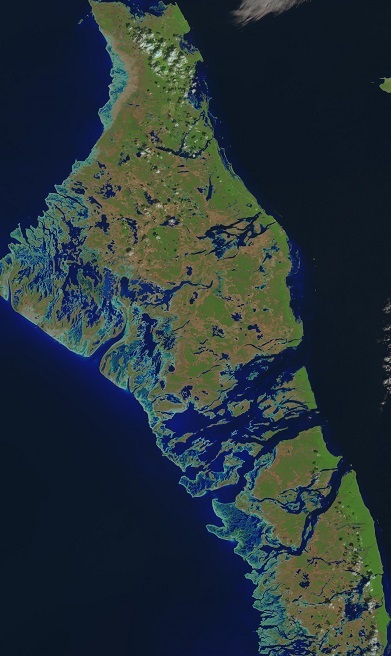 Acquired by Landsat 8 in February 2017. Data courtesy of NASA. The image to the right is from the south of the island. Just off the centre, you can see a blue hole surrounded by forests and vegetation. So we can confirm that the amazing natural features called blue holes can be seen from space, even if they don’t always appear blue! This entry was posted in Data, Earth Observation, Landsat, NASA, Oceans, Remote Sensing, visualisation and tagged Andros Island, blue, Blue hole, blue holes, Blue Holes National Park, Caribbean, Earth Observation, Jeremy Wade, Landsat, Lusca, remote sensing, River Monsters, sea monste, Space, The Bahamas by Andy. Bookmark the permalink.